Our Monogrammed Oxfords are the ultimate in preppy style! This high quality cotton/poly blend is wrinkle resistant & features a button down collar & pearl buttons. The monogram is placed on the pocket & will sew the pocket closed. **Please note, the Pink Stripe does not have a pocket & is a smaller stripe. These run very true to size! Men's XL is available to wear as a boyfriend shirt with leggings or as bridesmaids shirts! I purchased this shirt to wear while I get ready on my wedding day. I am so pleased with the level of craftsmanship and quality of the shirt. This garment runs true to size. Also, I recieved the shirt early then the shipping guarantee. I ordered these shirts for my bridesmaids so we could all wear them the day of the wedding. They are great quality and they were shipped so quickly. I am very pleased with this product and excited to wear them! I have 2 of these shirts one blue and one pink. The pink one seems to have a smaller fit. I just wish I didn't get the Lily monogram. 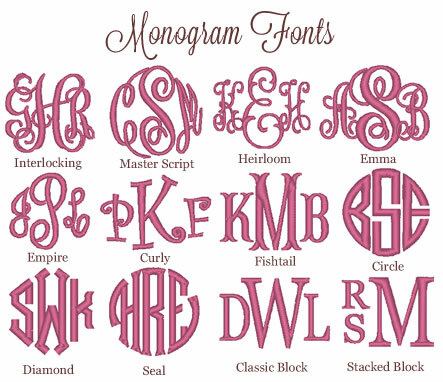 It's really small on the shirt compared to other monogram choices! Click the button below to add the Monogrammed Oxford Stripe Boyfriend Shirt to your wish list.